The 1948 Carling residence, which features a wall that swings open, built-in seating included, is again for rent. Not far from the Polin house, which is for sale, this house too is hung from vertical steel trusses, allowing free-flowing space within. See more in this Curbed L.A. article. A feature article in British Airways’ May 2011 magazine, on Palm Springs, is illustrated by several photographs of fashion models inside the Elrod residence. 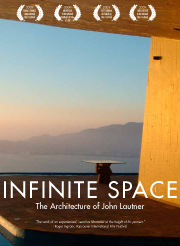 A brief mention of John Lautner is included in the article, most of which is about the history and current life of the desert city. Thanks to Richard (Kip) Serafin for this lead. For media inquiries, contact Erin Cullerton, Design Agency Co, erin@designagencyco.com. http://www.latimesmagazine.com/2011/07/culturedjuly-2011.html (may need to find “culture(d)” section from main page. According to Curbed LA, the Rawlins’ house in Newport Beach, for sale since June, has dropped in price from $5.495 million to 5.195 million. Check the related link on the Curbed LA site for more information on the house.